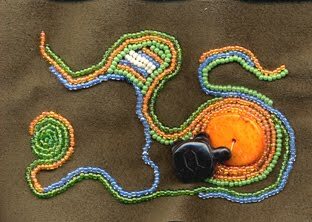 I am still plugging away at my March Bead Journal Project, and thought I would post an in-progress scan. I’m not sure when I’ll finish it, but I am enjoying just doing whatever comes to mind with this one. The fabric is a darker mossy green/brown piece of ultrasuede. I am using brighter colored beads this month, which I think stand out nicely on the background. And I had this neat-looking turtle bead that I wanted to include. So, I have sort of ended up with a turtle on an orange rock with a very colorful body of water around it. At least that’s how I see it! I’m always interested in everyone’s interpretation, so feel free to leave comments. Have a great week! Previous Happy Easter and a daffodil! Next March Bead Journal Project – finished! Love your drawings and your March piece is beautiful! I love how you used the turtle bead on the little stone with the water around him. A perfect and peaceful setting. Sure looks like the turle is heading somewhere! Love the colors! This one speaks of flow and of connectedness to me… I love it!Your flower/plant drawings are fabulous, Carol!I'm only doing March now too… and I want to take my time with it… let it develop, just as you seem to be doing.Robin A. Thanks, Robin! I actually had time to do some more on it this week and I agree with you – flow and connectedness seems to be the theme. It's been a fun one to create. Looking forward to finishing up and starting April! Glad you are enjoying the artwork, too!